Analogue photo taken with film and real chemistry. Parallax Photographic Cooperative. WordPress is an excellent content management system that is behind around 25% of all sites on the internet. Our busiest site is Raspberry Pi which is now constructed from multiple different WordPress installations and some custom web applications, stitched together in to one nearly seamless high traffic website. We’ve taken the knowledge we’ve gained supporting this site and rolled it out as a managed service, allowing you to concentrate on your content, whilst we take care of keep the site up and secure. In addition to 24/7 monitoring, plugin security scans, and our custom security hardening, we’re also able to assist with improving site performance. We’re now hosting a broad range of sites on this service with the simpler cases start with customers such as Ellexus, who make very impressive technology for IO profiling, and need a reliable, managed platform that they can easily update. 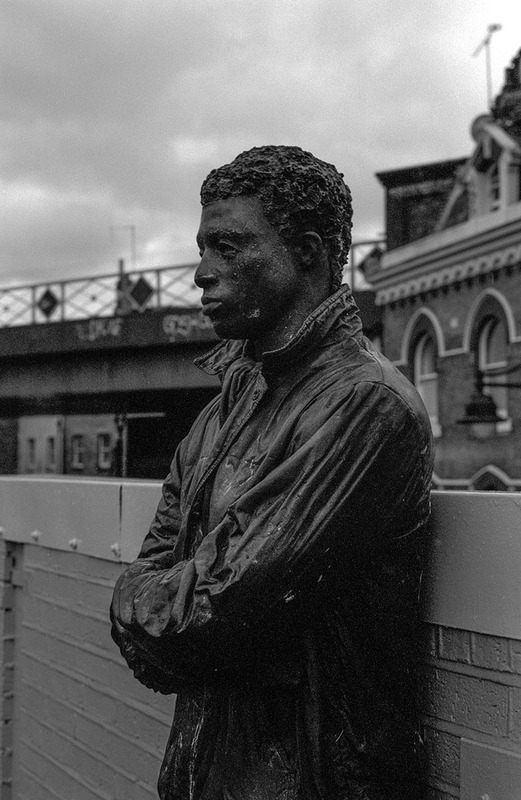 At the other end of the spectrum we have the likes of Parallax Photographic, a co-operative in Brixton who sell photography supplies for people interested in film photography, using real chemistry to develop the photographs and a full analogue feel to the resulting prints. Parallax Photographic use WordPress to host to their online shop, embedding WooCommerce into WordPress to create their fully functional e-commerce site. Parallax were having performance and management issues with their existing self-managed installation of WordPress. We transferred it for them to our managed WordPress service, in the process adding not only faster hardware but performance improvements to their WordPress stack, custom security hardening, managed backups and 24/7 monitoring. We took one hour for the final switch-over at 9am on a Sunday morning leaving them with a faster and more manageable site. They now have more time to spend fulfilling orders and taking beautiful photographs. Purrmetrix monitors temperature accurately and inexpensively, and as you can see above with excellent embeddable web analytics. In addition to hosting their website and WooCommerce site for people to place orders, we are also customers (directly, through their website!) using their site to monitor our Raspberry Pi hosting platform. The heatmap (above) is a real-time export from their system. At the time of writing, it shows a 5C temperature difference between the cold and hot aisles across one of our shelves of 108 Pi 3s. The service provides automated alerts; if that graph goes red indicating an over temperature situation alerts start firing. During the prototyping and beta phase for our Raspberry Pi hosting platform, we’ve used their graphing to demonstrate that it takes about six hours from dual fan failure to critical temperature issues. This is long enough to make maintenance straightforward. Also embedded in our Raspberry Pi hosting platform are multiple Power over Ethernet modules from Pi Supply who make a variety of add-ons for the Raspberry Pi, including some decent high quality audio adapters. With the launch of the Raspberry Pi 3 we had to do some rapid vertical scaling of the Pi Supply managed WooCommerce platform – in thirty seconds we had four times the RAM and double the CPU cores to cope with the additional customer load. We host a wide variety of WordPress sites include Scottish comedy club Mirth of Forth, personalised embroidery for work and leisure wear and our own blog that you’re currently reading. So if you’d like to have us run your WordPress site for you, from a simple blog to a fully managed e-commerce solution or one of the busiest sites on the Web, we’d love to hear from you at sales@mythic-beasts.com. Sky completed their IPv6 rollout – any device that comes with IPv6 support will use it by default. Yesterday we attended the annual IPv6 Council to exchange knowledge and ideas with the rest of the UK networking industry about bringing forward the IPv6 rollout. For the uninitiated, everything connected to the internet needs an address. With IPv4 there are only 4 billion addresses available which isn’t enough for one per person – let alone one each for my phone, my tablet, my laptop and my new internet connected toaster. So IPv6 is the new network standard that has an effectively unlimited number of addresses and will support an unlimited number of devices. The hard part is persuading everyone to move onto the new network. Two years ago when the IPv6 Council first met, roughly 1 in 400 internet connections in the UK had IPv6 support. 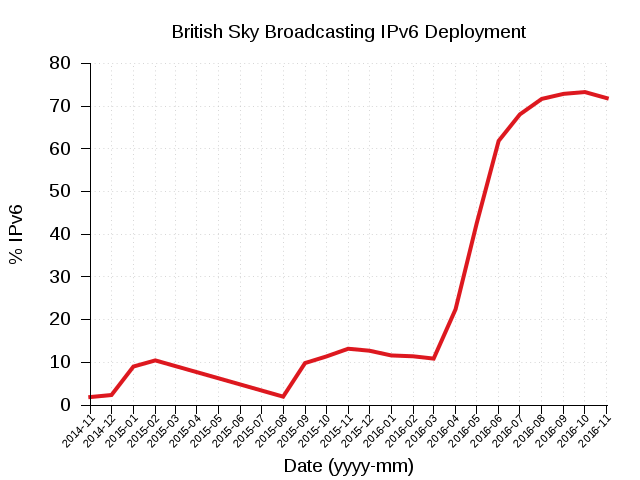 Since then Sky have rolled out IPv6 everywhere and by default all their customers have IPv6 connectivity. BT have rolled IPv6 out to all their SmartHub customers and will be enabling IPv6 for their Homehub 5 and Homehub 4 customers in the near future. Today 1 in 6 UK devices has IPv6 connectivity and when BT complete it’ll be closer to 1 in 3. Imperial College also spoke about their network which has IPv6 enabled everywhere. Major content sources (Google, Facebook, LinkedIn) and CDNs (Akamai, Cloudflare) are all already enabled with IPv6. This means that as soon as you turn on IPv6 on an access network, over half your traffic flows over IPv6 connections. With Amazon and Microsoft enabling IPv6 in stages on their public clouds by default traffic will continue to grow. Already for a some number of ISPs, IPv6 is the dominant protocol. The Internet Society are already predicting that IPv6 traffic will exceed IPv4 traffic around two to three years from now. LinkedIn and Microsoft both spoke about deploying IPv6 in their corporate and data centre environments. Both companies are suffering exhaustion of private RFC1918 address space – there just aren’t enough 10.a.b.c addresses to cope with organisations of their scale so they’re moving now to IPv6-only networks. Back in 2012 we designed and deployed an IPv6-only architecture for Raspberry Pi, and have since designed other IPv6-only infrastructures including a substantial Linux container deployment. Educating the next generation of developers about how networks will work when they join the workforce is critically important. We don’t like to pre-announce things that aren’t ready for public consumption. It’s no secret that we’d love to offer hosted Raspberry Pis in the data centre, and in our view the blocker for this being possible is the unreliability of SD cards which require physical attention when they fail. So we’ve provided some assistance to Gordon to help with getting netboot working for the Raspberry Pi. We built a sensible looking netboot setup and spent a fair amount of time debugging and reading packets to try and help work out why the netboot was occasionally stopping. This isn’t yet a production service and you can’t buy a hosted Raspberry Pi server. Yet. But if you’d be interested, we’d love to hear from you at sales@mythic-beasts.com. This is a standard Raspberry Pi 3 with a Power over Ethernet (PoE) adapter. You have to boot the Pi once from a magic SD card which enables netboot. Then you remove the SD card and plug it in to the powered network port. PoE means we can power cycle it using the managed switch. At boot, it talks to a standard tftpd server and isc-dhcp-server, this then delivers the kernel which runs from an NFS root. It’s a minimal Raspbian Jessie from debootstrap plus sshd and occupies a mere 381M versus the 1.3G for a standard Raspbian install. The switch is reporting the Pi 3 consuming 2W. The Raspberry Pi topple is just for fun. Last week at the UK Network Operators Forum Pete gave a talk about our IPv6 only hosting, progress we’ve made and barriers we’ve overcome. 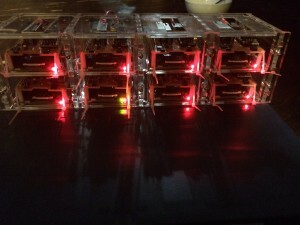 At the end of March we migrated the Raspberry Pi website from a very big multi-core server to a tiny cluster of eight Raspberry Pi 3s. Here’s a bit more detail about how it worked. For the Raspberry Pi 3 launch we tried out some Pis running in a data centre environment with high load using the SD card for the root filesystem. They kept crashing, if you exceed the write capability of the card the delays make the kernel think the storage has failed and the system falls over. We also want to be able to remotely rebuild the filesystem so we can fix a broken Pi remotely. So we’ve put the root filesystem on a network file server, which is accessed over NFS. and uses that as the root filesystem. On a traditional switch, you plug things and any ethernet port can talk to any other ethernet port. If you want to have two different networks you need two different switches, and any computer that needs to be on both networks needs two network ports. In our case we’re trying to have a private network for storage for each Raspberry Pi, so each Pi requires its own switch and the fileserver needs it’s own network port for every Raspberry Pi connected to keep them separate. This is going to get expensive very quickly. Instead we turn on virtual LANs (VLAN). We connect our fileserver to port 24 and create a VLAN for ports 1 & 24, another for 2&24, etc. The switch configuration for the fileserver port specifies these VLANs as “tagged”, meaning our switch adds a header to the front of every packet from a Raspberry Pi port that allows the fileserver to tell which VLAN, and therefore which Raspberry Pi, the packet came from. The fileserver can reply with the same header, and that packet will only be sent to that specific Raspberry Pi. It behaves as if each Raspberry Pi has its own switch. eth0.10 and eth0.11 appear to be network cards with a tiny network with one Raspberry Pi on the end, but in reality there’s a single physical ethernet connection underneath all of them. On the Raspberry Pi, eth0 is already configured on the Raspberry Pi by the boot line above to talk to the fileserver. On our switch configuration, we specify that private network is “untagged” on Raspberry Pi port, which means that it won’t have a VLAN header on it and we can access it as “eth0” rather than “eth0.N” as we did on the fileserver. Effectively the Raspberry Pi believes it has two network cards, one on eth0 which is a private network shared with the fileserver, one on eth0.131 which has an IPv6 address and is connected to the real internet. In an ideal world we’d have a single IPv6 address for each Pi, and mount the network filesystem with it. However, with an NFS root filesystem, potentially another user on the LAN who can steal your IPv6 address can access your files. There’s a second complication, IPv4 is built into the standard kernel on the Raspberry Pi and the differences per Pi are constrained to just the kernel command line, with IPv6 we’d have to build it into an initrd which would load up the IPv6 modules and set up the NFS mounts. Planning for the future we’ve spoken to Gordon about how PXE boot on the Raspberry Pi will work and it’s extremely likely that it’s going to require IPv4 to pull in the bootloader, kernel and initrd. Whilst there is native IPv6 in the Raspberry Pi office, there isn’t any IPv6 on their test lan for developing the boot code and it’s a currently not a major priority for the Pi despite around 5% of the UK having native IPv6. So if we want to make this commercial, each Pi needs its own storage network and it needs IPv4 on the storage network. We’ve added a Power over Ethernet HAT to our Raspberry Pis. This means that they receive power over the ethernet cable in addition to the two separate networks. As well as reducing the amount of space used by power bricks, it also means you can power cycle a Raspberry Pi just by re-configuring the switch. Each Raspberry Pi runs Raspbian with Apache2 installed. We’ve pulled in PHP7 from Debian Stretch to improve PHP performance and then copied all the files for the Raspberry Pi website onto the NFS root for each Raspberry Pi (so the fileserver effectively has 8 copies – one for each Pi). We then just added the IPv6 addresses of the Raspberry Pis into the site’s load balancer, deleted the addresses for the main x86 servers and waited for everything to explode. Slightly to our surprise, yes and well. We had a couple of issues – the Pi is much slower than the x86 servers, not only clock speed but also the speed of the network card used to access the filesystem and the database server. Some rarely used functions, such as registering a new Raspberry Jam, weren’t really quick enough under the new setup and gave people some error pages as the connections timed out. Uploading images for new WordPress posts was similarly an issue as receiving a 3MB file and distributing eight copies on a 100Mbps network isn’t very fast. But mostly it worked. Did power cycling the Pis via the switch work? We never tested it in production, every Pi remained up and stable for the whole 3.5 day duration we had the system in use. In testing it’s been fine. Not yet. At present you can still break a Pi by destroying the flash, and the enclosure doesn’t allow for replacement without taking the whole shelf (which in production would contain 96 Pis) offline. Once we have full netboot for the Pi, it is a service we could offer. Can I register my interest to buy a Pi in the cloud? Sure – email us at sales@mythic-beasts.com and we’ll add you to a list to keep you up to date. Today, we’re nervously watching all the server graphs as the new Raspberry Pi 3 launches and goes on sale. We’ve had one to play with for a while so we did what we do with any new shiny toy: benchmark it in a real world application. Our Raspberry Pi 3 next to a Raspberry Pi 2 serving requests for the Raspberry Pi 3 launch. Our favourite application is rendering WordPress pages for the Raspberry Pi website, so we set up a testbed: Pi2 and Pi3 versus the virtual machines that run the blog. We picked a typical page and tried them out. Initial results weren’t promising – just one fifth the speed of the production VMs. 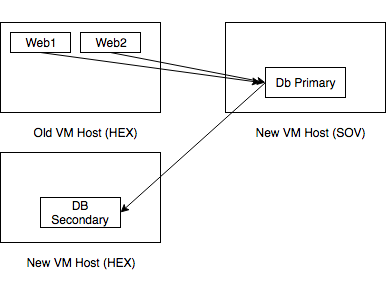 The VMs have the advantage of being on the same physical server as the VM that hosts the database. Moving the Pis to the same switch as the database server, and upgrading from PHP 5.6 to PHP 7 brought Pi 3 page rendering times that were less than twice as long as the production servers. That’s fast enough to be usable. Parallelising requests across all cores, we can probably sustain about 4 hits/second from the Pi 2, 6 hits/second from the Pi 3 and around 50 hits/second for the main site. These figures are for uncached pages. As we’ve seen in the past, 50 hits/second isn’t even close to enough to cope with launch day traffic. In reality, the vast majority of pages we serve are cached and both Pis can adequately serve 100Mbps of cached pages (versus 4Gbps for the main host). indicating your page request came off a Raspberry Pi 3. We’re aiming to serve about 1 in 12 requests from a Pi 2 or a Pi 3, but may adjust this up or down to keep the pi in action and not melting under the load. The backend for the Raspberry Pi site is built from virtual machines. 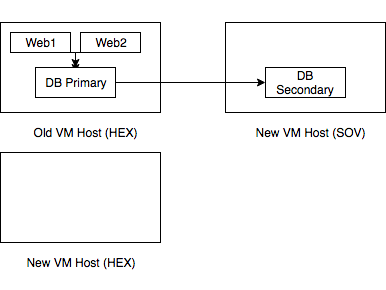 One VM runs the database, and a pair that generate pages for the main, WordPress-based, website. One of the pair is designated as primary, and also runs the admin backend for WordPress, which then synchronises files to the other VM, now additionally, both the Raspberry Pis. All the backend servers exist on a pure IPv6 network. 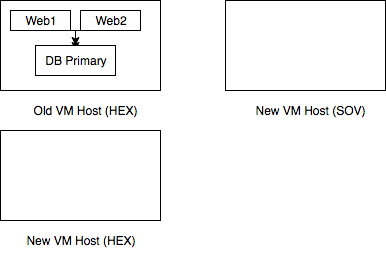 We have a cluster of front-end servers that are dual stack, and load balance requests through to IPv6-only backends. If you don’t have IPv6 complain to your ISP, then set up a tunnel at he.net. The two Pis can tweet directly at @hostingpi3 and @hostingpi2. 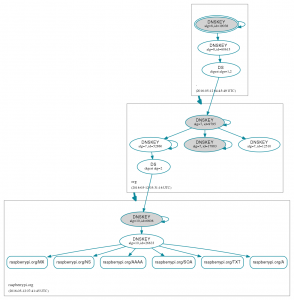 Sadly, Twitter doesn’t support IPv6 so traffic goes via our NAT 64 service that provides outbound connectivity for IPv6-only servers to legacy parts of the internet. We like Open Source software, so instead of paying enough money to rent quite a nice car for a trivial .htaccess file we instead chose to install yourls on a little IPv6-only virtual machine behind our NAT64 and IPv6 Proxy services. We’ve done some benchmarking, out of the box we could sustain 500 hits/second, adding in php-apc boosted this to well over 2000 hits/second which should be enough, even if Liz Upton gets very excited with the Raspberry Pi twitter account. So you can test out the service here http://rpf.io/mythic before we start making these links public.